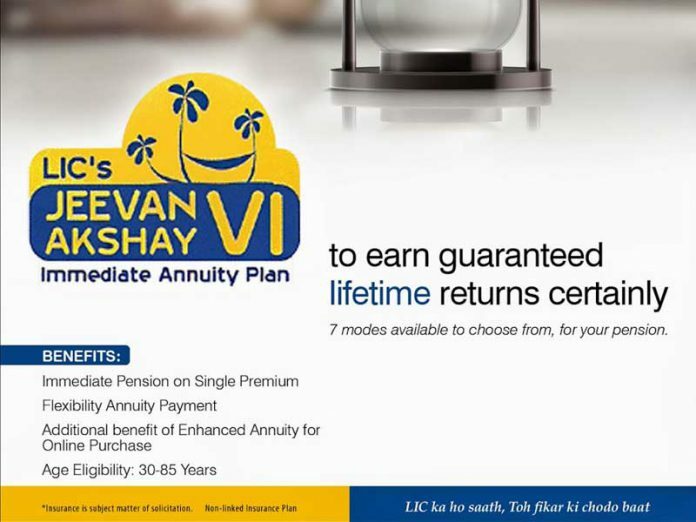 LIC Jeevan Akshay VI is a very popular Single Premium Pension Plan, which means by paying a single premium, you can buy the Annuity plan and after that LIC will provide you with a certain amount for the rest of your life on a regular basis. You can get this amount monthly, quarterly, half yearly or annually as per your requirement. The policyholder can pick any mode of annuity payment. However, once chosen the payment option, the option can’t be changed because of the pension of this plan starts immediately after buying the plan. After buying a policy in LIC Jeevan Akshay VI, the pension will start immediately without any delay. In case of death of the life assured, then the pension depends entirely upon the pension option chosen by the policyholder. Under the life insurance policy, premium payment is exempted. The sum of tax payable won’t be measured for the calculation of the benefits payable. The Tax on the premiums will be deductible under Sec 80C of Income Tax (IT) Act, 1961. The benefit sums receivable are exempted from the tax under Sec 10(10D) of Income Tax (IT) Act, 1961. There isn’t any maturity benefit available under the LIC Jeevan Akshay VI Plan as this plan is also to protect the risk of survival for long and pension is provided immediately according to the selected option. In case the policyholder commits suicide just within one year of the beginning of the plan, regardless of the fact whether a person was insane or sane the policy won’t pay for that. The solitary claim allocated under the case, there will be a refund of up to 80% of total premiums paid excluding taxes & added premium paid by the policyholder. Annuity payable for life enhancement by a simple rate of 3% P.A. Death of annuity for life with the provision of 100% payable to the spouse during his lifetime. The purchase price will be refunded on the death of the last survivor. Q. Is there Surrender Value available under the LIC Jeevan Akshay VI Plan? A. 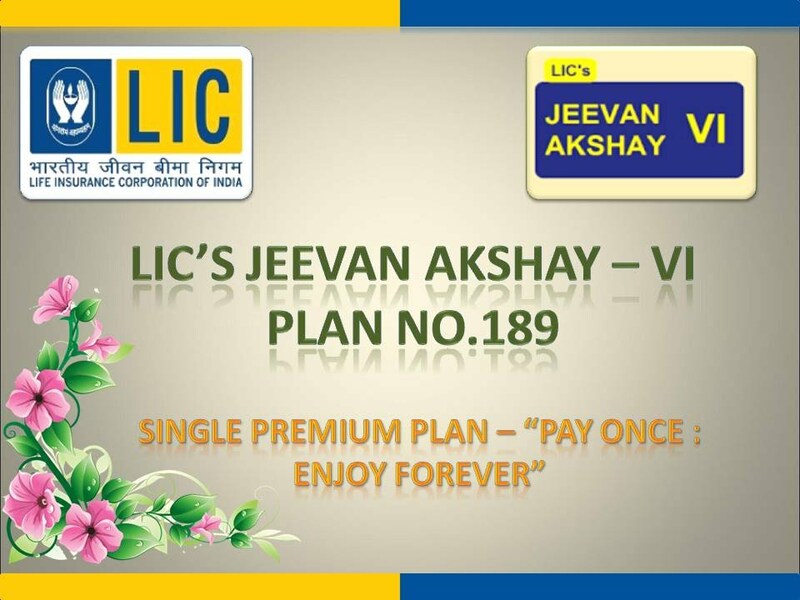 A dedication value will be paid under this LIC Jeevan Akshay VI Plan. Q. Is there any Proposal Form used under the LIC Jeevan Akshay VI Plan? A. Proposal Form No. 440 (IA) will be used under this scheme. Q. Is there any Rider available under the LIC Jeevan Akshay VI Plan? A. Additional riders are not available. Q. What is the Loan Facility LIC Jeevan Akshay VI Plan? Q. 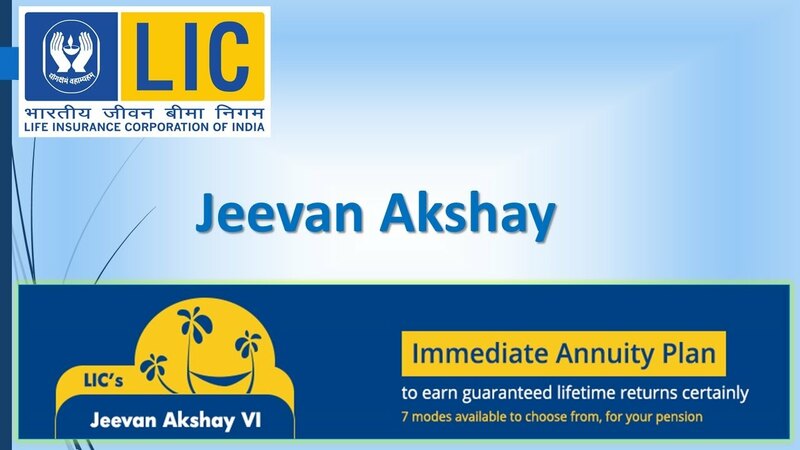 Are there Any Special Incentives If You Buy the LIC Jeevan Akshay VI Plan Online? A. A Special Incentive Annuity Basic rate offered for online buyers, if you buy this plan online, the basic rate is more than 1%. Q. 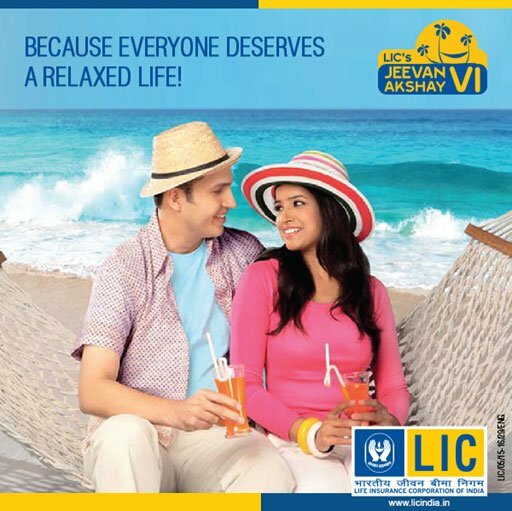 Is there any Leisure time under the LIC Jeevan Akshay VI Plan? A. If the policyholder is not satisfied with the ‘terms & conditions’ of the policy, then 15 days from the date of receipt of the policy can be returned. Q. Is there any Service tax under the LIC Jeevan Akshay VI Plan? A. 12.09% service tax is applicable in this plan.